Phase 1 workshop ‘Topological Prototypes’, taught by Tom Verebes and Jeroen van Ameijde. The aim of this workshop module was the systematic investigation of workflow between computational design and production methods, via the systematic exploration of complex geometries in relation to digital fabrication methods, using prototyping as means to evaluate and adjust design models. A parallel objective was to challenge norms of the production of architectural space, emphasising the performative aspects of curvilinear architectural systems to enable new possibilities of how space can be occupied in increasingly more haptic, tactile and immediate modes. A topological approach to formal effects emphasises the transformation of multiple forces in evolutionary, time-based, formal processes. With introductory design exercises focusing on the iterative evolution of formal topological of primitive, yet complex mathematical forms, this module seeked to explore the capabilities of time-based, data-driven and interactive design methodologies. These new topological spatial descriptions investigated the ways in which matter is fundamentally shaped by information, in the creation of emergent, topological architectural organisations. The brief of this module was to design a set of increasingly refined prototypes of an Inhabitable Wall, challenging the assumption that walls are meant to be vertical, flat, and act as epidermal divisions between different activities, rather than inhabitable, porous and deep. Design proposals dealt with three requirements: that the Wall is self-supporting; that it is inhabitable by groups of people concurrently for a broad range of (un-)imaginable activities; and lastly, that the wall acts as a device to control the transmission of views and light through the depth of the wall. Conceived as infrastructure on the domestic scale of furnishing, with notional dimensions of 5m long and 2.5m high, the Inhabitable Wall seeked to regulate differentiated spatial, material, programmatic, and sensorial qualities. Through integrating the characteristics of digital manufacturing technologies into the design process for a rule-based, adaptable field of associated primitives, design teams applied prototyping as a methodology to develop design recursive processes as well as new modes of material production. 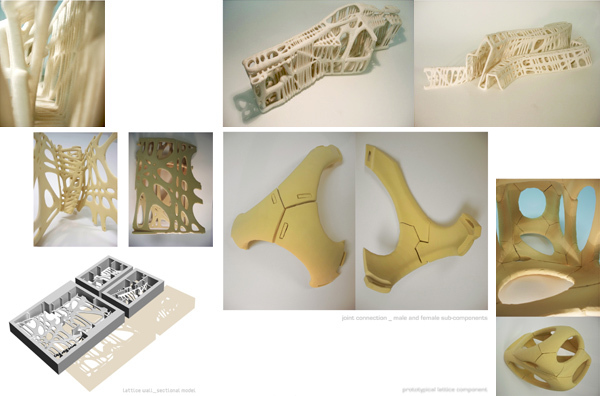 Using Maya/MEL expressions, scripting and dynamics as tools to control the proliferation of possible variations of a component-based system, design teams tested four sequential weekly stages of generative design work in a series of prototypes applied to the problem of designing an inhabitable wall. Experimenting with 3D printing and CNC milling prototyping technologies as the primary means of design output, this course investigated design to production processes and the automated file-to-factory flows between software and hardware technologies.